Anyone looking to do a November Swap!? where will it be most likely? As of right now that is not known. Someone will have to volunteer to host before we know where and when. So first I would like to welcome our newest sponsor Back Woods Reefs! I paid them a visit in New Ipswich this last weekend to pick up a fish and take a look around. 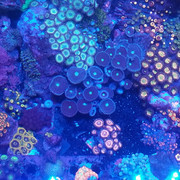 I must say that I have never seen so many different zoas and palys in one place. They were still adding tanks, but would like to host our November swap. I'm still working out the date, but more info will be coming soon. Additionally, I discussed another grow out contest and settled on a single polyp White Rhino paly (Center of Photo) with a $10 buy in. I wanted a coral that nobody had and I think this is the one. I don't know what the prize will be yet, but I encourage as many people as possible to participate. It's a great discussion topic for the club and its fun to do. More to come guys. Let me know any thoughts or input! I’m new here but really excited to take part in the swaps and grow outs. Pretty sure I’m not going to be winning any growth prizes but it’s fun to try. I am going to be doing some revamping of my nano soon so I plan on starting a build thread. I'm in for a Paly grow out ! ! ! (10-23-2018, 04:05 PM)Fudsey Wrote: I'm in for a Paly grow out ! ! ! Now that my tank is up and running, me too! Also new here and looking forward to taking part in the next swap! Are we close to having a date? November is a month that fills up fast for me.